Despite not having a lot of money, Vegas was a lot of fun. 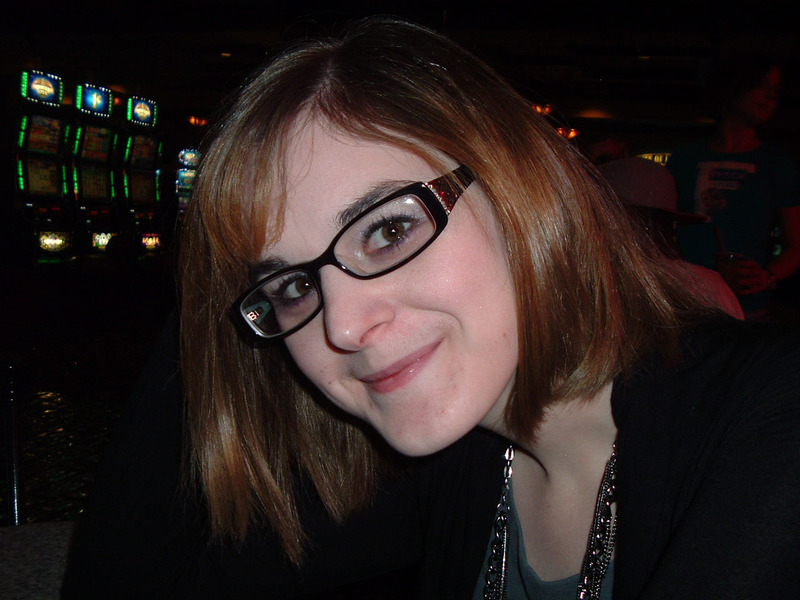 We went to five different casinos, and we somehow managed to lose money at all of them. We definitely hit a string of bad luck last night! We decided we would only gamble $20 of our money, and our luck was so bad that we lost it within the first hour at our first casino, Whiskey Pete’s. This was incredibly frustrating because when we left Whiskey Pete’s, it was only 11pm AND it’s actually 40 miles outside of Vegas. However, when we arrived at our first Vegas proper casino, the New York New York, John and Shantel bought us an amazing strawberry daiquiri from the bar Coyote Ugly and gave us another $20 (have I ever mentioned how much I love them???). After we got our drinks, we walked across the bridge over the strip to the MGM Grand and gambled most of our $20 away there. We actually almost won all of our money back – we hit $36 on a machine and I jokingly said that we should quit for the night. I really wish we would have, because that was the highest we got all night. When we walked into the MGM Grand, we went past the entrance for Studio 54. If Travis had had his damn ID, I probably would have skipped the gambling and gone in there. He lost his license a couple of weeks ago and only has his old, expired one that has holes punched in it. Blast! I am definitely going next time we’re in Vegas, though – with or without him. Losing all of that money made me crave food in a bad way. I wasn’t hungry, I just wanted comfort food. I’ve never been a stress eater until recently, when I gave up another habit I used as anxiety control. So, we were about to call it quits and get some food (me some clam chowder and Travis a pretzel) when John and Shantel decided it was time to move on to the next casino. 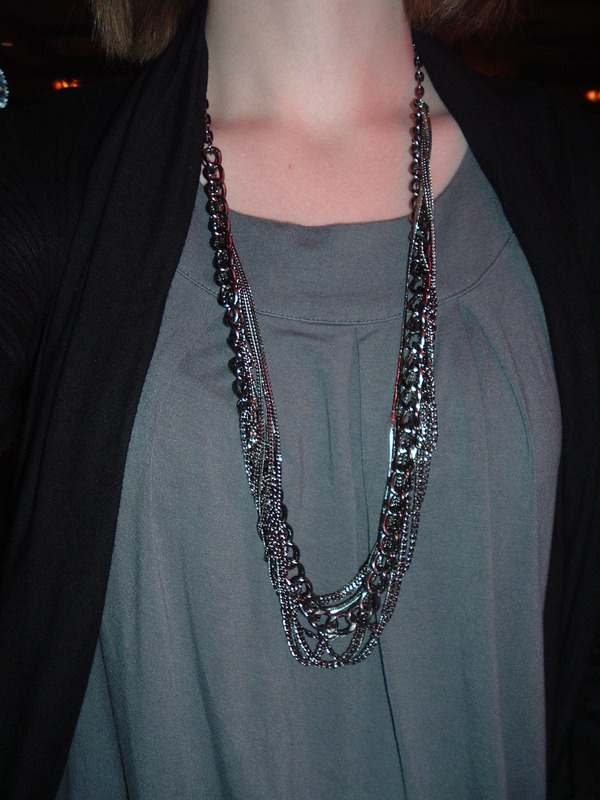 Vegas Style Tip :: Wear something that will still be flattering if you get bloated from too much alcohol and junk food. After stopping for gas (John came out with a Snickers candy bar for me and completely made my night), we drove off the Strip to a more Wendover-like casino called the Texas Station. 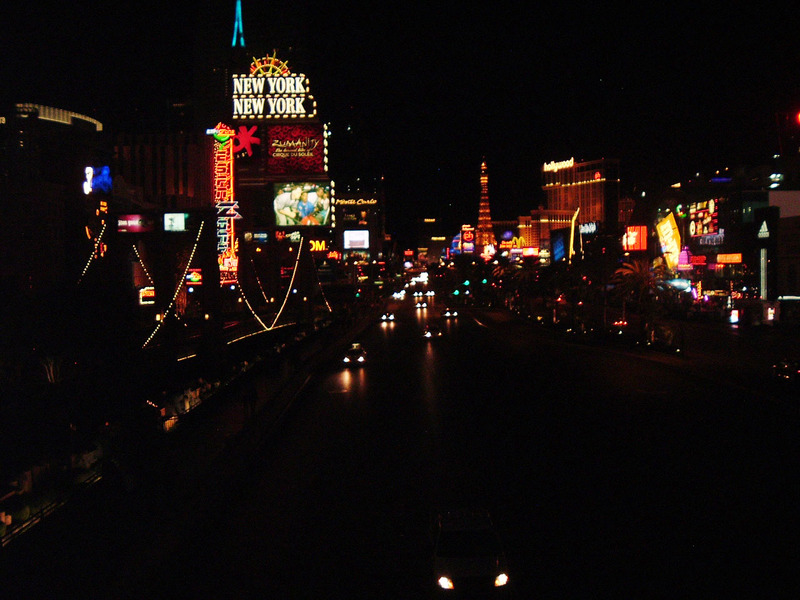 It was nowhere near as crowded as the casinos on the Strip – in fact, it was pretty empty. I was definitely okay with that though, because at this point in the night I was pretty tired. I hadn’t slept much the night before, so it was kind of nice to get away from the crowds, the noise, the dirt and the constant fear that someone was going to make off with my purse. In fact, I really didn’t want to carry my purse for most of the night for just that reason – it’s kind of a big target. 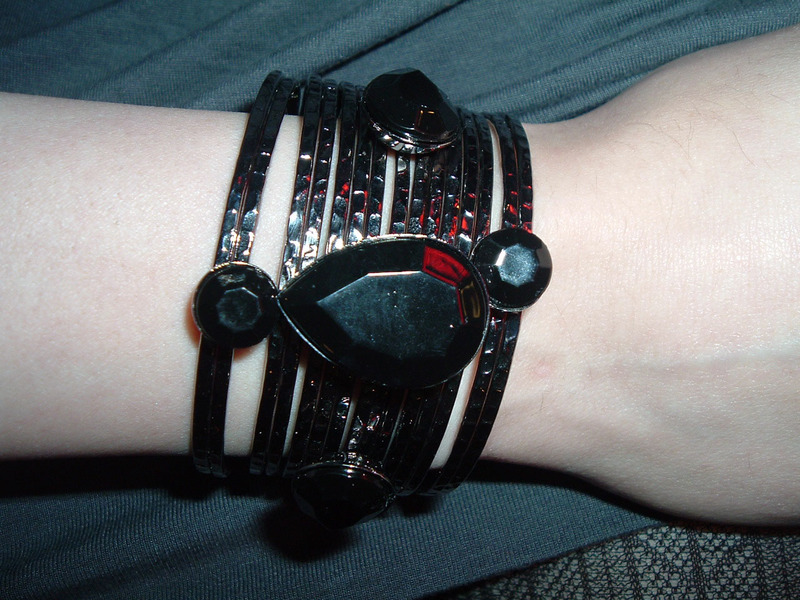 I had meant to grab my tiny black clutch, but we were in such a hurry to leave that it completely slipped my mind. 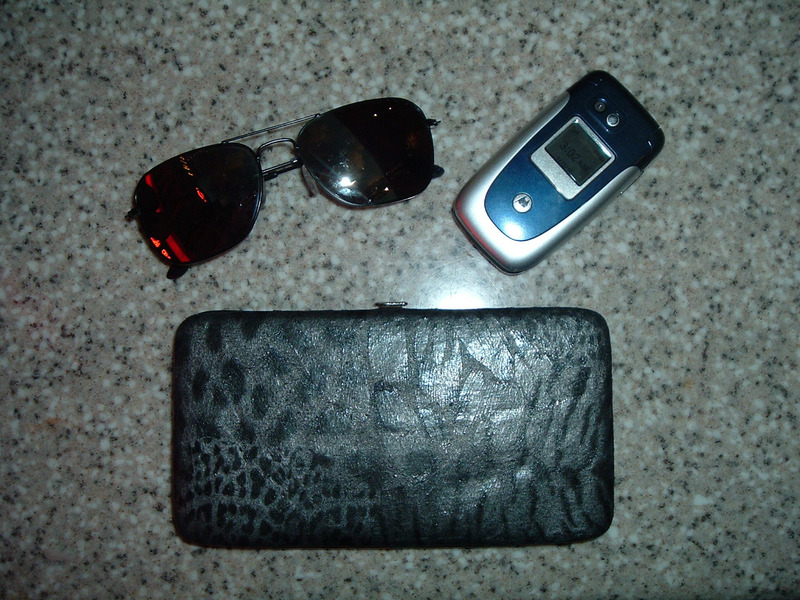 Instead, I actually used my leopard print wallet case as a clutch for most of the evening. 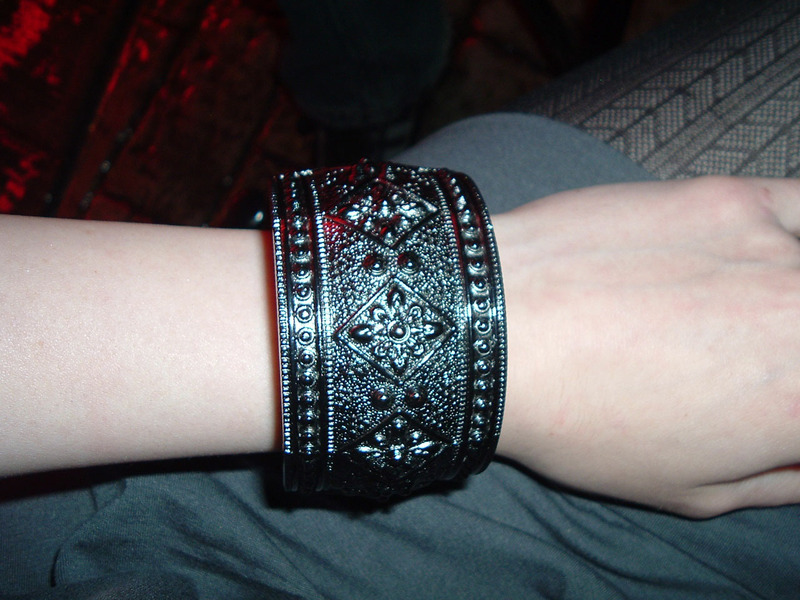 Travis was kind enough to put my lipstick and eyeliner in his pocket, so the wallet was perfect – small enough that it wasn’t conspicuous, carried it so it couldn’t be pick-pocketed, and held in my lap when sitting so no one could grab it, but big enough to hold what I needed to have with me. Vegas style tip :: Take a bag/wallet that you can keep your hands/eyes on at all times; only use your pockets if they’re deep, and shove your money & ID as far into the pocket as possible. When we arrived at Texas Station, we had planned to go immediately in search of that comfort food, but John was kind enough to give us another $10 so we could play a bit more. We lost it, put in another $5, got it back, and decided we were done. Honestly, I’m not much a fan of gambling. It’s more fun when you’re drinking (and winning), and the daiquiri was the only drink I had last night. The Strip has some pretty swanky casinos, but Texas Station is awesome – they have movie theaters and a pretty decent sized food court. 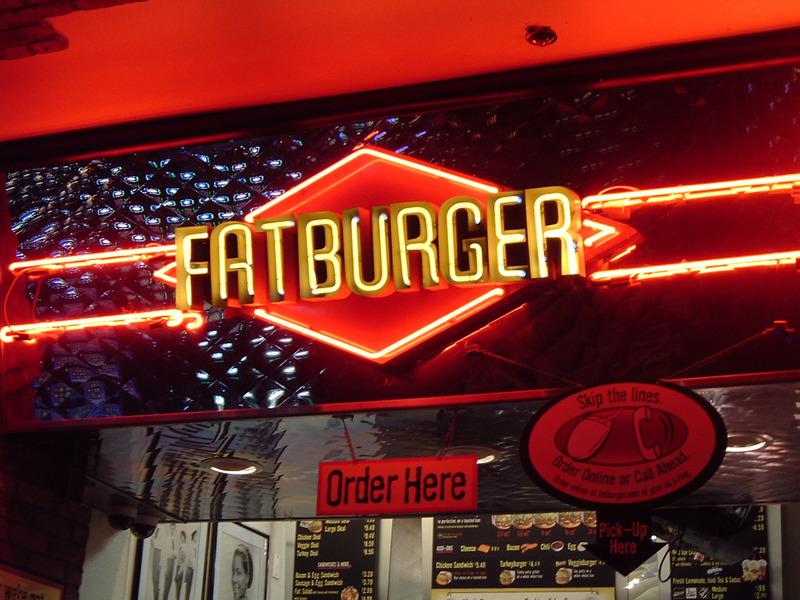 It was 3am though, and the only restaurant open was Fatburger. 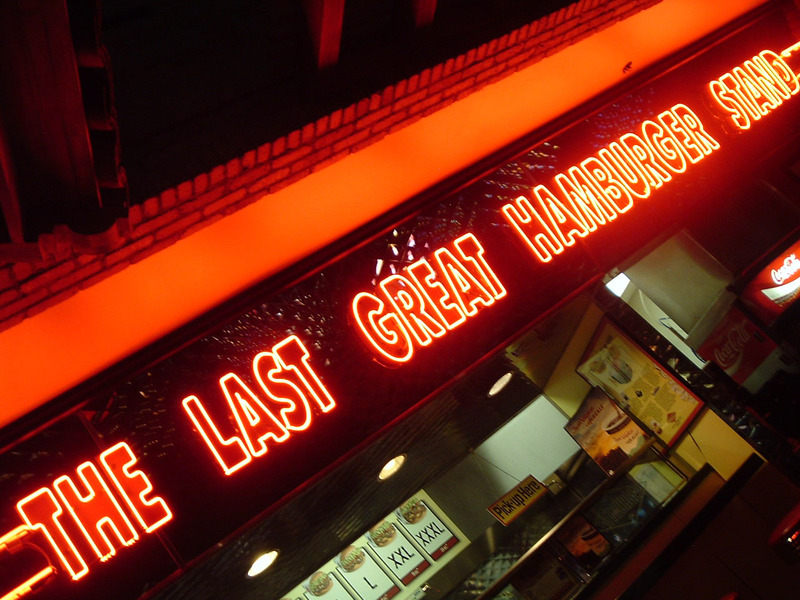 I love me some french fries, but I very rarely eat burgers… and never at a fast food joint. However, for some reason last night I was craving one like none other. Even more strange was the fact that I wanted stuff on my burger. Normally I get a slice of beef and a bun, cheese if I’m feeling adventurous. But last night, I got cheese, mayo, lettuce and onions. I NEVER eat onions. There was definitely something wrong with me last night. I did order the smallest burger on the menu, 2.5oz, but it definitely did not disappoint me. It was amazing. 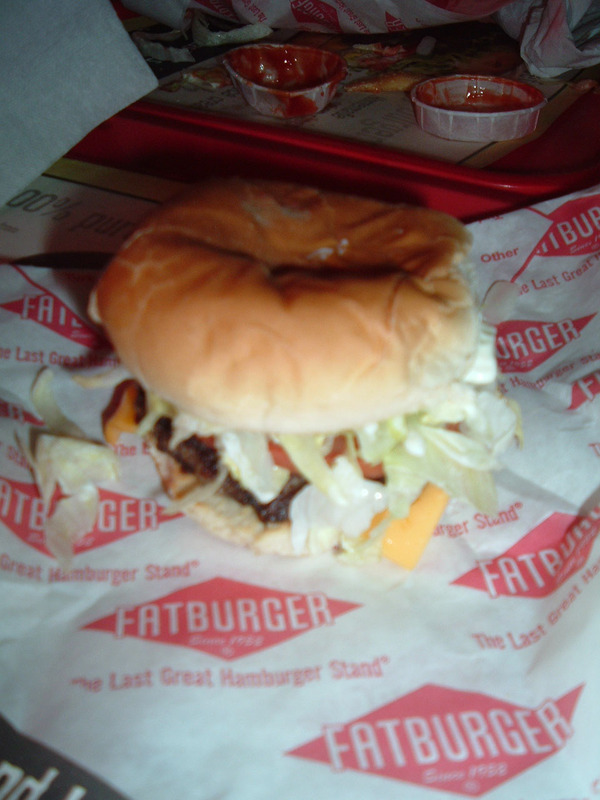 In fact, next time I’m in Vegas I may have to wander over to Texas Station just for FatBurger. Seriously the BEST burger I have ever had. And the fries??? OMG… the fries. They give you a choice of steak or skinny; we ordered steak but were lucky enough to get some of both. The only thing that could possibly have made them better would have been fry sauce. (for the non-Utahns out there, fry sauce is a mixture of ketchup and mayo for french fries). When we were done eating, we talked and laughed, and I entertained myself by taking photos of everything in sight. 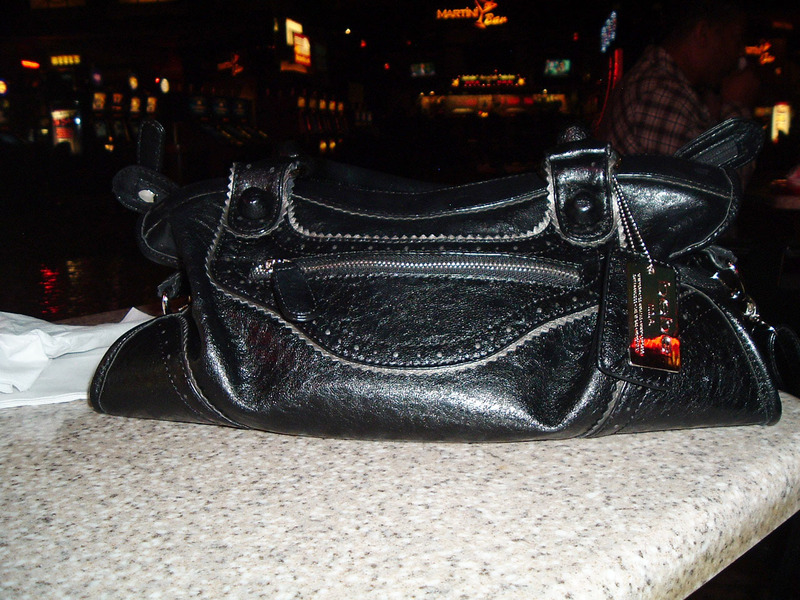 Vegas Style Tip :: Carry a purse size hand sanitizer with you at all times. After just an hour of gambling, I could feel the layers of dirt and grime and disgustingness covering my hands. 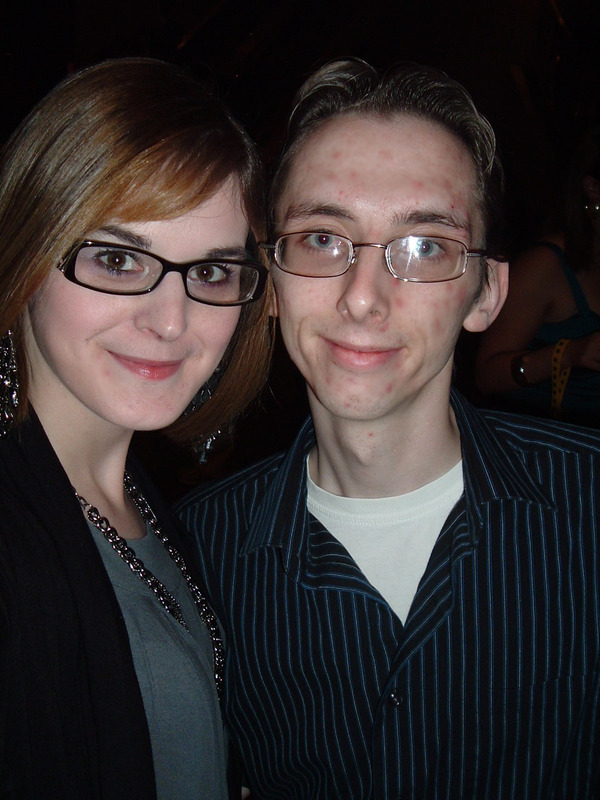 The first half of the night I wore my second favorite pair of heels, my black buckle ankle boots. I thought Travis got them in the very first photo of me, but apparently not. I will get a picture of them up asap. After walking between casinos and around the machines for a few hours though, my feet started to swell and really hurt. 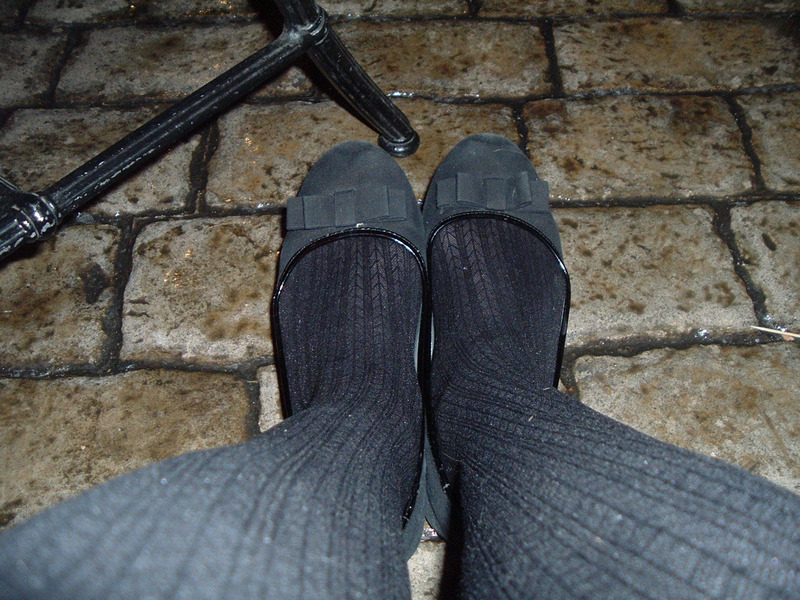 I’m definitely glad I brought my ballet flats with me… I seriously might have died otherwise! Vegas style tip :: If you’re wearing heels, make sure to bring a pair of flats with you to the casinos. Keep them in your car, in your purse, or make your husband put them in his back pocket, but bring them!!! Unless you are accustomed to walking miles on hard floors and pavement and standing for hours in them, bring your flats as a back up. Texas Station was meant to be our last stop for the night. John and Shantel got done gambling a while after we got done eating. We piled into the car and started towards home on I-15, and I started to doze off in the car. When we reached the outskirts of Vegas, John decided to stop at the South Point casino to use the restroom. On his way out, John and Shantel got distracted by a machine, so Travis and I contented ourselves by playing video Black Jack (we won 29 cents) until they finally decided it was time to go – at 5:45 in the a.m.
Vegas style tip :: No matter how cute they are, don’t wear extremely heavy earrings. They will start to hurt after an hour or two. Despite my normal sleep schedule, I was incredibly exhausted at this point; despite how tired I was, I felt strangely restless and didn’t get to sleep until we were nearly home anyway. When we arrived home, at about 9am, I went straight to bed but still couldn’t get to sleep for some time… and when I did I slept until 6pm. There is definitely something wrong with my sleeping patterns. I decided to give regulating them one more shot, and I stayed up all night last night. It’s about 7am and I’m fighting the urge to crawl into bed. I still have that restless feeling, so I’m not sure that I could sleep even if I tried. I’m strongly considering a caffeine run when I’m done with this post. I’m still working on those updates I mentioned in my previous post; they will surface throughout the day today. When I’m done, I will write a post detailing the changes. I’m really excited about it! I’m strongly considering moving this blog over to Blogger. I definitely prefer the Word Press interface, but (from what I can tell) Blogger gives me greater freedom with the template and design of my blog, as well as additional tools to help me promote it. BUT… I’ve already done a lot of promoting with this blog and this address. I don’t know what to do! I know that unless Word Press releases their death grip on the blog templates soon, I will eventually have to move over. But I really do love this interface. Argh. What do you guys think? 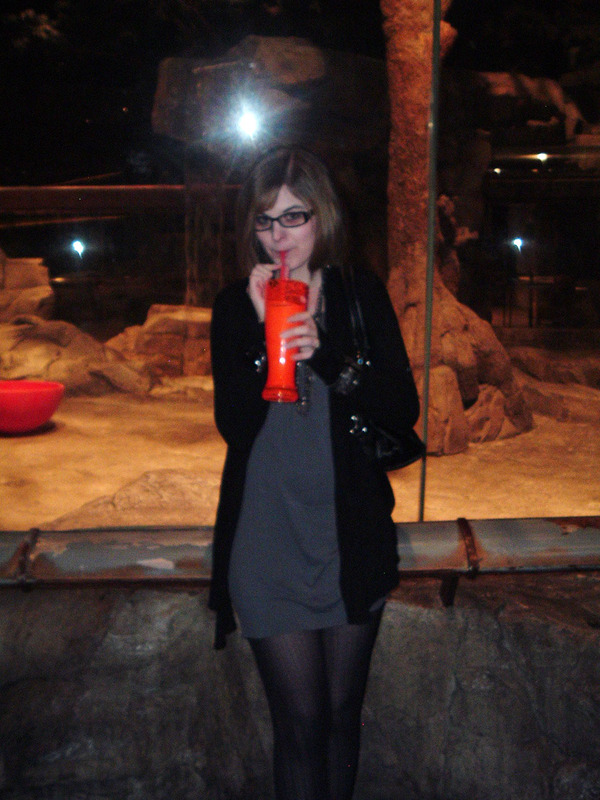 This entry was posted on Sunday, May 16th, 2010 at 7:28 am	and tagged with adventure, advice, cardigan, casinos, charlotte russe, clothes, Fashion, fatburger, food, forever 21, french fries, gambling, mgm grand, money, new york new york, outfit, photos, pictures, south point casino, style, texas station, textured tights, tips, tunic dress, vegas, vegas style tips, whiskey pete's and posted in Adventurous Enterprises, Self Styled. You can follow any responses to this entry through the RSS 2.0 feed. I love Vegas, that is my home town. I can’t really enjoy everything though until I turn 21. 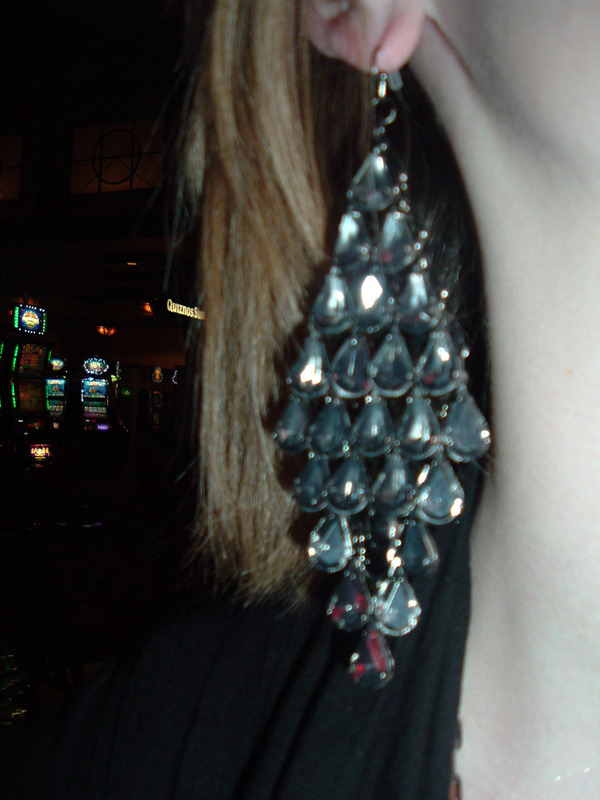 Love the earings.